∙ Reckless drunken driver’s rear end collision causing massive thoracic injuries to school teacher and head injuries to her elderly mother. ∙ 35-year-old pilot suffers paraplegic injuries from a fall when the two-story balcony railing failed. ∙ Wrongful death/medical malpractice as a result of failure to timely diagnose sepsis. ∙ Motorcycle/truck accident causing serious closed head injuries to college student. ∙ Boating accident causing wrongful death of 48-year-old husband and father. ∙ Wrongful death of 38-year-old pilot and his mom when their single-engine airplane crashed in severe weather. We regularly publish “Petition”, our firm’s newsletter, but also contribute and write for other legal publications, including Trial Magazine and Daily Business Review, and have been invited as guest lecturers to numerous organizations, including, the Colorado Trial Lawyers Association, the North Carolina Advocates for Justice, New Jersey Association for Justice, Louisiana Association for Justice, Melvin Belli Society, Monroe County Bar Association, Palm Beach County Bar Association and American Association of Justice on various topics of interest to the trial bar and public. 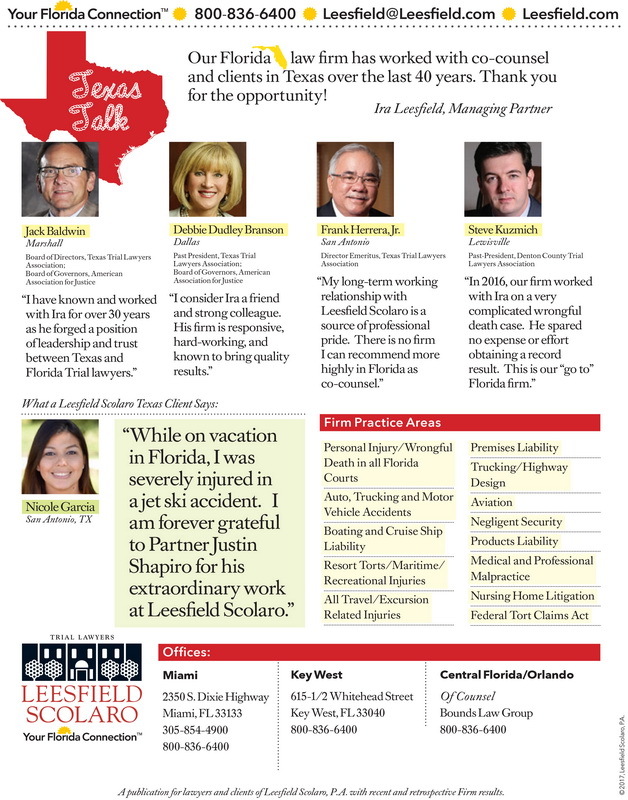 In August, the American Association for Justice’s publication, Trial Magazine, featured an article entitled Excursions Gone Wrong which was a centerpiece during the year amongst in-state and out-of-state trial lawyers. This year also brought a high recognition to Managing Partner, Ira Leesfield, as he was awarded the 2016 Trial Lawyers Care Award at the American Association for Justice Annual Convention held in Los Angeles, CA. The nation’s largest trial lawyer organization nominated Leesfield for his extraordinary, consistent and long-term dedication to help the less fortunate Americans and the South Florida community through difficult times. 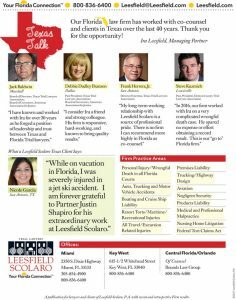 In addition, Leesfield and his firm were profiled in the Daily Business Review outlining significant achievements during the year. 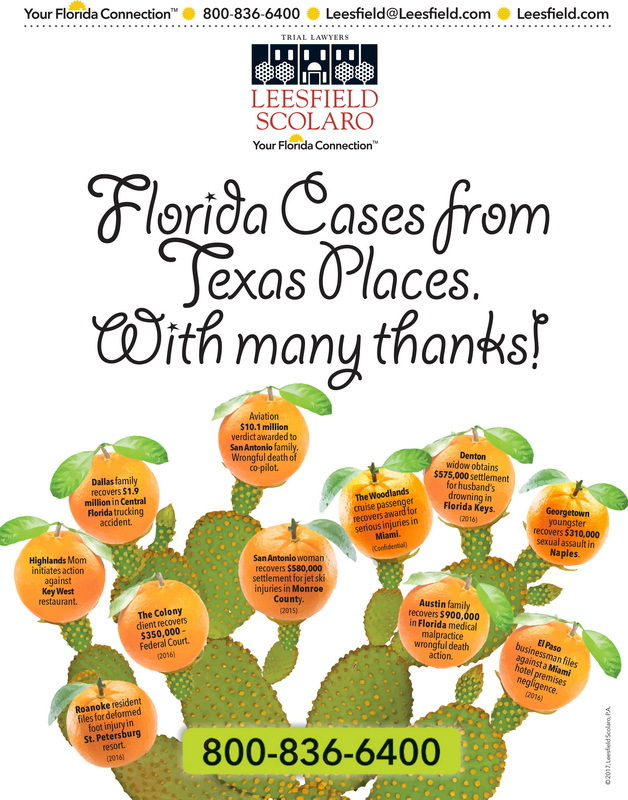 Thank you to our clients, friends, co-counsel and the community for your ongoing support.